As an April Fool's joke, an employee of an AM News Radio station manufactured the story below about snow removal in Evanston, IN. Funny or cruel? You decide! EVANSTON, Ill. (CBS/WBBM) — Some angry Evanston residents have been calling City Hall to complain about the city's new snow removal program, as detailed in the community newspaper the Evanston Roundtable. But it turned out to be an April Fool's story. As WBBM Newsradio 780′s Mike Krauser reports, Evanston is dealing with a budget crisis, and a huge bill for the blizzard back on Feb. 2 and 3, which dumped 21.2 inches of snow on the Chicago area. The Roundtable reports under the new plan developed by the city's Snow Czar, Pearl Le Blanc, anyone who wants snow removed in front of their homes will be required to buy a "snow removal sticker." For an additional $2 fee, a driveway clearance sticker is available. This sticker will direct snow removal crews not to pile snow in front of your driveway while clearing the street, the Roundtable reported. In the event of a snowfall greater taller than the 22-inch orange cones, the City of Evanston will also offer mylar balloons to stick on the cones. The balloons will have the stickers already attached, and will raise the cost of the sticker to $4, the newspaper reported. The plan goes into effect when the first snowfall of next season comes, in late fall or early winter, the newspaper reported. Shawn Jones is the author of the fictional story. "I certainly thought that the snow czar, Pearl De Blanc, would clue a lot of people in early on," Jones said, "also the fact that this article came out on March 30 and referenced an April 1 city council meeting." ...Illinois tomorrow night? We'll see! I'm talking about snow here, in case you didn't guess! Yesterday, parts of southeastern Iowa saw up to 2.7" of snow. Today it was Ohio's turn. A feature called an inverted trough swept through parts of Ohio, Pennsylvania, and Michigan earlier today with moderate to heavy snow at times. Both the Cleveland and Youngstown airports reported 3" of snow on the ground by the time the snow ended. Late tomorrow night and Friday morning, it could be our turn to see some flakes. I think we'll at least be cold enough to see mixed precipitation... Low pressure dropping in from the northwest will bring rain and snow to the Stateline after midnight Thursday night. At this point, air and ground temperatures look to warm to support accumulation. But snow is still kind-of a cruel April fool's joke for most of us this late in the season! Once our next weather maker passes Friday night, the attention will then shift to another storm system expected to move through late in the day Sunday. As it looks right now the low will likely track through central Illinois during the evening Sunday keeping us on the cool side of the warm front. An easterly wind at the surface will help hold temperatures down into the middle and upper 40s during the afternoon. Most of the precipitation should fall in the form of rain with the possibility of stronger storms to the south. When the low passes on Monday, however, there may be enough cold air wrapping in on the backside to once again deal with a rain/snow mix by Monday night. Now I know you're thinking - "why are we talking about snow when it's going to be April"? Just remember this, it's still possible to see the white stuff in April. After all, April averages a total of 1.4" of snowfall! With high pressure still dominate across the Great Lakes, today will likely be the nicest out of the next several days. This blocking high has kept a lot of systems from reaching the Great Lakes the past couple of days but as it slides off to the east, a cold front will move through early on Friday. Temperatures early Friday morning are going to be near freezing so there is a possibility of a rain/snow mix during the morning hours. However, as temperatures warm above freezing during the afternoon the precip should change over to rain before ending as a rain/snow mix Friday evening. This pattern will be somewhat hard to break in the coming week or so as cooler air from the north will continue to move south as our jetstream, for the most part, continues on its southern track. Further to the south a developing low will continue to gain strength this evening and move up the east coast by this weekend. Rain and snow showers will be likely for residents there as they greet the beginning of April. I'm not predicting the play of the Chicago Cubs or the Pittsburgh Pirates by any means here! This is strictly about the weather and how it could impact the game. On Friday, the Cubs and Pirates open the 2011 season at Wrigley Field at 2:20pm. At the very best, the weather looks chilly for this time of year with highs only in the 40s. At worst, snow could dust the baseball diamond! We're watching an Alberta-clipper that will dive into the U.S. and toward northern Illinois on Friday with some rain and snow. The computer models suggest we'll be cold enough for snow Thursday night when the system starts to move into the area. It also appears cold enough for snow on Friday afternoon, but with the high April sun angle and the timing of this low in question, we have a rain/snow mix in the forecast for now. Stay tuned... this could be a rotten opening game weather-wise! 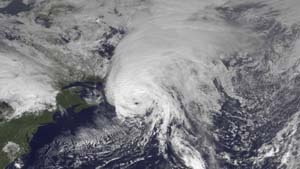 NOAA forecasters are warning, "The worst is yet to come." And no, they aren't talking about the NCAA basketball Final Four teams or Lindsay Lohan's newest addiction, they are talking about flooding. Nearly half of the United States has an above average risk for flooding over the next couple weeks. Even though we may not be in the "High Risk" area for flooding, we aren't far from it. Cities like Rock Island and Davenport have a greater than 95% chance of major flooding. The picture to the left, shows the current snow cover in the U.S. With the warmer temperatures forecasted for this week, the snow may not be there long. With the snow melting, this will cause major flooding in South Dakota and minor flooding on the Mississippi River. Along with warm temperatures forecasted, there are a series of storm systems expected as well. Whichever the precipitation type may be, rain or snow, it will only add to the amount that is already on the ground. Because of these ongoing systems, major flooding will continue to be a threat throughout the rest of the season. Specifically along the state line, the Rock River and the Pecatonica River are no longer under flood advisories. However, the Rock River at Rockton is at a "near flood stage." Just to our east, there is a flood warning for the Fox River at Algonquin that is affecting McHenry and Kane County. A flood advisory is also in continuation for the Fox River at Montgomery for Kane and Kendall County. Well some may wonder, why do we continue to babble about these floods? Not only is it important to our area this season, National Flood Safety Awareness Week was recently held. We want to continue to raise awareness over the ongoing flooding. When people come across the question of what is number one weather-related killer, flooding probably does not make the top three. On the contrary, flooding IS the deadliest weather phenomena and on average, it claims 100 lives per year. During recent years, flooding has caused billions of dollars in damage each year. They are among the most common and widespread of all natural hazards. The National Weather Service is reminding people that if you encounter a flooded roadway on foot or in a vehicle, Turn Around, Don't Drown. Hurricane Igor and Hurricane Tomas are two names that we won't be hearing in the upcoming Atlantic hurricane season. 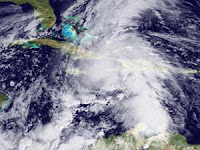 The two tropical cyclone names were officially retired from rotation by the World Meteorological Organization's hurricane committee because of the deaths and damage they caused in 2010. Igor and Tomas would have appeared in 2016 but will no longer be used. In their places will be Ian and Tobias. Click here for more information on the damage both hurricanes caused. The Stateline will continue to be under the influence of a massive area of surface high pressure located over south central Canada. Temperatures have be well below average for the last few days, and it will continue to be cooler than average to start off the work week, with a little easing through the middle of the week. The Canadian high will move a little eastward each day so that it's influence on the Stateline will be gone by Friday. With high pressure nearby for the whole week, very little precipitation is expected, and there should be less than a tenth of an inch during the next 7 days. When will preciptiation occur during the next week? Well, we do get a chance of some light snow or flurries on Tuesday night with a system passing well to our south. Another system approaching from the west could cause some light rain showers on Friday when temperatures will probably be back up around 50 degrees. Another system could cause some scattered showers on Sunday. So, there will be a gradual warm up this week, and by next weekend temperatures should be in the low 50's. A massive area of Canadian high pressure is crossing from northeastern Manitoba into northwestern Ontario tonight. It's effects are being felt tonight from the northern Rockies southward across northern Texas and from there eastward across Arkansas, Tennessee through the North Carolina coast, all of the northeast, all of the Ohio valley, all of the midwest, all of the northern and central plains. The high is originially out of the arctic areas of the far north, so it is cold, and has low dew points associated with it. As the high continues it's very slow eastward trek across southern Canada it will pump this chilly dry air to the south keeping the Stateline well below normal temperature-wise for the next few days. The wind will be northeasterly at 10-15 mph tonight and Sunday. Our lows tonight will be in the low 20's, and highs on Sunday with only be in the middle to upper 30's. The average high temperature for Rockford for Sunday March 27th is 51 degrees. What appeared to be a potential strong late season winter type storm now looks less impressive. The models have downplayed the development of a strong storm system affecting the midwest on Tuesday, Tuesday night and Wednesday to the point where only some light snows are expected. Stay tuned to see if there is any significant changes on that development. After the weakened version of the storm passes well to our south on Wednesday, temperatures are expected to make a nice recovery back up to seasonal levels by Friday. Light snow will continue to move south and southeast of the immediate Stateline with only a few flurries possible later today as an upper level disturbance slides south. The easterly winds we have this morning will continue to dry out the lower layers of the atmosphere so any snow that does try to make it north will likely evaportate before reaching the surface. A cool and dry airmass has settled in over much of the Great Lakes and will keep the majority of the storm systems to the south. The next system will move through Saturday afternoon and just like the one this morning will shy away from the Great Lakes. Only a few flurries will be expected with this, if any. The chilly weather, unfortunately, will continue straight through the middle to end of next week. The month of March hasn't been too bad in terms of temperatures. We even managed to squeeze out a 67° on St. Patrick's Day. That, however, will soon be a thing of the past as temperatures the remainder of this week and next will likely range 10° to 12° below average. A blocking pattern has developed that will likely keep highs in the upper 30s; something we'd typically see in February. An area of high pressure at the surface will continue to reside across southern Canada keeping the colder air filtering in through the Midwest and Great Lakes. A chilly northeast wind at the surface will keep highs in the upper 30s straight through the weekend. With this northeast wind, however, drier air will continue to be pumped in which will help keep the majority of the precipitation away as the storm track will be shifted further to the south. A couple disturbances rippling through the jetstream may bring a few flurries Friday afternoon and then again on Saturday (although this may completely miss us to the south). It looks like any major storm systems will hold off until at least next Tuesday. 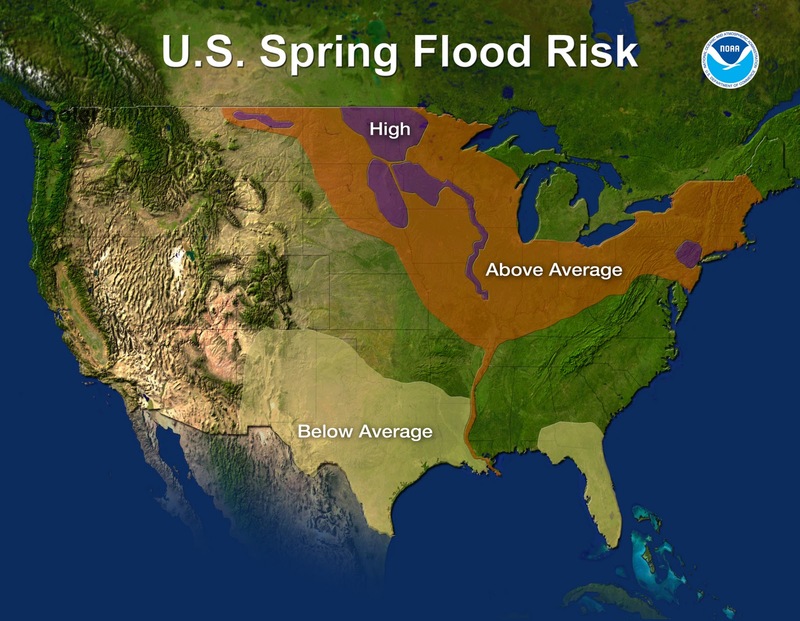 With the snowpack as big as it's been in the last 60 years across the northern Plains, the potential for spring flooding is high this year. Between two and ten inches of water can be found in the snowpack in some areas, with the possibility of even higher amounts in places like northeastern Minnesota. 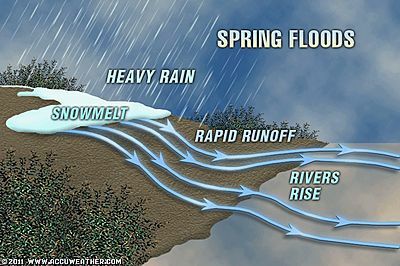 When warmer temperatures arrive, snow melt could cause rivers to over-run their banks. The Red River between Minnesota and North Dakota is of particular concern, as are the Big Sioux and James rivers in South Dakota. Locally, the Rock and Pecatonica rivers are already running high. Flood advisories continue for the Pecatonica River near Shirland. Also, the Rock River continues its advisory in Byron and Latham Park. There is a flood warning for the Rock River at Rockton from late Saturday night until Monday morning. Along with Rockton, the Rock River is also affecting Afton. This flood warning will start Thursday morning and will continue until further notice. In Janesville, floodwaters will affect Riverside Park and South River Road where the impact is at 10.5 feet! 5:30 am Update: Showers continue to move east this morning leaving mostly cloudy skies in its wake. Easterly winds will keep it fairly chilly this morning before shifting to the north later this afternoon. Watch for fog and drizzle this morning. The dry slot is moving through Iowa so we may be able to break up some of the cloud cover later this morning, however I do expect the clouds to move back in on the backside of the low with even a few light snow showers showing up later this afternoon. 1:45 am Update: Radar rainfall estimates across northern Lee county are suggesting close to one inch of rain has already fallen within the past hour. This quick, heavy rain will likely cause flooding of low lying areas such as ditches, underpasses, creeks and drainage areas. 1:30 am Update: While the severe threat has since diminished, heavy rainfall will continue to move east early this morning. Heavy rainfall will continue to move through southern Winnebago, Ogle, Lee and DeKalb counties so watch out in Oregon, Amboy, Ashton, Rochelle, Byron and Kirland. Although there is still a Severe Thunderstorm Warning in effect for southern Whiteside county until 12:15am, radar trends and upstream reports indicate that the potential for severe weather is ending this morning. Although we've seen warnings popping up along and west of the Mississippi River over the past couple of hours, the hail reports with these storms have generally been for 1/2" diameter hail or less. (To meet severe criteria, hail must be 1" diameter or greater.) Winds have generally been less than 50mph, well below severe thresholds of 60mph. It also appears that the heaviest returns with this line of storms are dissipating and becoming less-organized. Therefore, most areas will see brief, heavy downpours, small hail, and winds gusts approaching 35 to 40 mph as these storms move through. Rainfall amounts may exceed 0.5" in some cases. Since coming in to work today at about 1pm, my thinking has been that hail will be the main threat with any storms that do come our way. Sure enough... The National Weather Service just issued a special weather statement for small hail with a complex of storms that are approaching the Quad Cities. We'll keep you posted on these storms as they move to the northeast tonight. STRONG THUNDERSTORM NEAR WAPELLO...MOVING NORTHEAST AT 70 MPH. ONE HALF INCH DIAMETER HAIL...IS EXPECTED WITH THIS STORM. 6:00pm Update: Strong storms continue to develop west of Des Moines this evening right along the warm front and to the east of the surface low. Winds changing with height have allowed individual storms to develop and rotate producing numerous tornado warnings. This was the area that saw clearing earlier this afternoon allowing for that destabilization. Closer to home a few heavier showers can be found stretching from southeast of the Rockford Metro up through Loves Park and Machesney Park and into Janesville. These will continue through the evening. We'll have to watch how well the storms out west hold together and if they form into a line of storms later tonight as they move northeast. Noon Update: Skies remain cloudy as of the noon hour with temperatures sitting in the low to mid 40s. Scattered showers will continue through this afternoon. The warm front remains to our south through central Illinois and the area of low pressure will continue to deepen and move northeast into northwest Iowa later this afternoon. Clearing has already been noted across northwest Missouri with the associated dry-slot and this will likely be the focus for thunderstorms to initiate later this afternoon. Rain and thunderstorms will increase in nature as the warm front continues to pull north, likely around the 5pm hour. The greatest threat for any type of significant severe weather will continue to remain around the low centered in southern Iowa, however, we're still looking at the potential for hail, gusty winds and heavy rainfall with any storms should they develop. We're still going to watch the movement of the warm front as wind shear may be enough to get a few rotating storms right along the front. This may impact our far southern counties. The storm chances will continue through the overnight as the low pulls closer with hail and gusty winds. We'll have another update for you coming later this afternoon. 8:00 am Update: A big temperature contrast will likely be found from north to south later this afternoon as a warm front slides closer to the Stateline. Temperatures on the north side of the front will likely remain in the 40s while south the 60s, and even 70s, could be possible. We are still under the slight risk for stronger storms later this afternoon with hail being the primary threat across the western Great Lakes. We dealt with a few showers and a couple embedded thunderstorms earlier this morning but those have since pushed off to the east and northeast. The warm front currently sits through central Illinois this morning and will try to advance northward as the day progresses. This will be in response to an area of low pressure that will continue to gain strength and move in northwest Iowa later this afternoon. There are a couple things we'll be watching fairly closely throughout the day in terms of our severe potential. One will be if we can clear out from under the chilly, cloudy skies. If we are able to clear some later this morning that will help draw the warm front closer which would likely bring an increase in the stronger storms. If we don't, then our severe potential would go down. There is a dry-slot (dry air moving in the mid-levels of the atmosphere) beginning to develop across southwest Iowa which will likely clear skies through southern Iowa and west-central Illinois. This could even move further north into northern Illinois. The main concern for us with the storms will likely be hail and heavy rainfall as the storms would become elevated the further north they moved. The highest risk for severe weather, including damaging winds and tornadoes, will remain south of the front through south-central Iowa. Better moisture return there combined with an increase in wind shear will help promote a few stronger storms later this afternoon. We'll continue to montior trends through this morning and afternoon and likely have an update for you around noon or 1pm. 4:20am Update: Scattered showers and thunderstorms will continue to move across northern Illinois and southern Wisconsin this morning. Heavy rainfall, and maybe pea-sized hail with some of the stronger ones, could be possible. A storm just northeast of Orangeville this morning will continue to move northeast into Rock County by 5am. Spring has sprung and it brought a plentiful amount of rain yesterday. With the continuous amount of showers our area received, a record setting 1.67 inches of rain accumulated! Now this may not seem like a lot, but this is over a quarter of the amount we have received this year! The last record rainfall for March 20th was less than half our amount, 0.70 inches. Spring for most of you may mean blooming flowers or the start of baseball season, but for us weather folk, it means not only severe weather, but also FLOODING! The National Weather Service in Romeoville has already issued a flood advisory. And just as the NWS stated, there is MORE precipitation forecasted for the rest of this week! Showers and thunderstorms will continue to overspread our region tomorrow. We might not make it until Sunday without seeing any precipitation at all. And always as a precaution: If you encounter a flooded roadway, turn around, don't drown. Dare I even say it? Could there be snow falling by the end of this week? It's possible! The relatively mild weather we've had so far this past week will be coming to end towards the end of this week and into this next weekend. While it's not completely set in stone, it does appear the mercury will be dropping below average with highs potentially struggling to make it out of the 30s as soon as Thursday! There are, however, a few differences leading up to this weekend. The European computer model wants to develop a fairly significant canadian high pressure system that would likely block any storm system from reaching the western Great Lakes. This would keep us dry, but also keep temperatures very chilly Saturday and Sunday. The GFS and a couple other models are not as strong with the high allowing the next low to move in as early as Friday. We would be chilly - but not bitterly cold. We would also likely see a rain/snow mix this weekend. Climatologically speaking it is possible to still get snow in April. Our average snowfall is 1.4". After our first wave of severe weather yesterday to mark the official start of the 2011 spring season - the potential is there for another round Tuesday. The cold front that passed through Sunday will stall to our southeast and east today. An area of low pressure will begin to develop out west and start to lift the front back north as a warm front later this evening and overnight. As it does the low level jet, winds a couple thousand feet above the ground, will increase helping to transport gulf moisture northward. This will cause showers and a few embedded thunderstorms to develop later tonight...likely after 10pm...and continue into Tuesday morning. After the first round of weather moves north the focus will then shift towards the afternoon on Tuesday and just how much daytime heating we will be able to accomplish as the warm front continues to lift into north-central Illinois. As of Monday morning, it appears the greatest threat for significant severe weather will reside to the southwest of the immediate forecast area. This is the region that will likely see the greatest moisture return and clearing during the afternoon. It will also sit near the 'triple-point', an area outlined by the warm front, cold front and low pressure. Typically this is where the greatest wind shear is found to support big storms. However, if the front does lift further to the north the greatest severe threat would be shifted north as well. If the warm front were to remain to the south any storms that would move north across it would become elevated with hail and heavy rainfall remaining the primary threat. Just like on Sunday heavy rainfall will once again be a concern as areas that saw over an inch of rainfall could potentially see that again Tuesday. We'll continue to monitor the progression of this system and keep you updated right here! And while we'll be dealing with the rainfall, further north across the northern Plains and into the upper Great Lakes Winter Storm Warnings and Watches have been issued as some could see six inches of heavy, wet snow. That should be fun! Severe thunderstorms with hail and heavy rainfall welcomed the first day of spring Sunday. An amazing 1.67" of rain fell at the Chicago/Rockford Int'l Airport breaking the old record of 0.70" set back in 1933! All that rain helped locally dense fog to develop early this morning but visibility will gradually improve throughout the morning as dry air moves in. Skies will remain partly to mostly cloudy this afternoon with temperatures reaching 60°. The heavy rainfall has prompted Flood Advisories for the Rock and Pecatonica rivers in Winnebago and Ogle counties. More rain is expected later tonight and Tuesday. A low pressure weather system that associated with the record amount of rain on Sunday is moving across the area now, and will press eastward ovenight. The thunderstorms have ended, and the showers will end before midnight. Skies will be mostly cloudy overnight, and partly to mostly sunny as a weak bubble of high pressure moves across the area on Monday. Monday will be the day for the pick day of the week. The high temperature will be close to 60 degrees. Enjoy the weather on Monday because the great weather will be short lived, and some major changes will take place dropping temperatures back to wintry levels from Thursday through next weekend. The front moving across northern Illinois will settle east/west across central Illinois on Monday, and stall out there, as a surface low pressure storm center emerges from the Rockies, and intensifies over the northern plains. A low level jet will develop on Monday night from the Texas gulf coast northeastward across the stalled front over central Illinois pumping volumes of moisture toward the Stateline. There will be a chance of showers and thunderstorms during the evening, and showers and thunderstorms will be likely after midnight. It will be windy and raw on Tuesday with more showers and thunderstorms. Showers will persist into Tuesday night, and there are indications that the precipitation will become more scattered on Wednesday as the surface low pulls right across northern Illinois. There is potential of 1" to 2" of new rainfall with this next system, and when added to the rains northern Illinois has received on Sunday, there could be some flooding issues by next Wednesday. On Wednesday night colder air from Canada will be pulled in behind the departing storm system leaving northern Illinois cold through the rest of the week. In fact, high temperatures look like they will only be in the 30's fromThrusday through next Sunday when it should be around 50 degrees this time of year. The Severe Thunderstorm Warning has been allowed to expire for Winnebago County. The storm has weakened some as it continues to move east around 40 mph. Currently it stretches from Belvidere to just southeast of Rockford. Heavy rain and hail will still be possible with this storm as it continues to move across northern Illinois. SEVERE THUNDERSTORM WARNING FOR STEPHENSON COUNTY HAS BEEN CANCELLED...BUT CONTINUES FOR WINNEBAGO COUNTY. This storm is quickly moving off to the east and is now near Pecatonica. Quarter sized (one inch) hail has been reported by trained spotters with this storm. This storm will be near Loves Park and Cherry Valley within the next couple of minutes. A SEVERE THUNDERSTORM WARNING HAS BEEN ISSUED FOR STEPHENSON COUNTY UNTIL 2:45PM. This storm is capable of producing quarter size hail and was near Freeport moving northeast around 40 mph. The storm will be near Cedarville, German Valley, Ridott, Dakota, Rock City and Davis within the next 10 minutes. SOME HAIL LARGER THAN PEA SIZED MIXED IN. HAIL COVERING GROUND. SOME DIME SIZED HAIL MIXED IN. JUST NORTHWEST OF ROUTE 20 AND INTERSTATE 90. AREAS OF STANDING WATER GREATER THAN 10 INCHES DEEP. A FLOOD ADVISORY has been issued for northwest Boone, Ogle and Winnebago counties until 5pm this evening. Radar rainfall estimates have indicated that between one and two inches of rain have fallen with the thunderstorms that have already moved through. Minor flooding was occurring as trained spotters in Rockford have reported several inches of standing water on some streets. With additional thunderstorms possible this afternoon and evening, it is likely the flooding will continue. 11:45am Update: Heavy rain and thunderstorms will continue through the early afternoon. Reports of pea to quarter sized hail have been common with the initial round of storms this morning. Some locations that have seen repeat thunderstorms will likely have rain totals nearing an inch or greater. ALSO...0.54 INCHES OF RAINFALL SO FAR WITH THE SHOWERS AND THUNDERSTORMS IMPACTING THE AREA. LASTED FROM 1010 AM TO 1020 AM CDT. OCCURRED 10 MINUTES PRIOR TO THIS REPORT. PEA SIZED HAIL FELL 1 MILE NORTH OF MOUNT CARROLL. ONGOING PEA-SIZED HAIL REPORTED BY OGLE COUNTY SHERIFF. PELLET SIZED HAIL FELL ABOUT 3 MILES WEST OF ROCK FALLS. 7:45am Update: Showers and thunderstorms will continue to spread across southern Wisconsin and northern Illinois this morning. Heavy downpours and even small sized hail could be possible with some of the stronger storms. A cold front approaching from the west later this afternoon could allow more storms to develop. However, the convection from this morning could keep those storms from becoming severe later today. A ridge of high pressure provided the Stateline with lots of sunshine, low humidity, light winds, and temperatures into the middle 50's on Saturday afternoon. It was a great day to get outside and enjoy the last full day of winter. The vernal equinox occurs late Sunday afternoon, so it will be officially spring when the sun goes down on Sunday night. A weather system over the plains is pulling itself together tonight. Winds from the southeast, and eventually from the south, will tap Gulf of Mexico moisture into the system, and scatter some showers into northern Illinois overnight. Rain will become widespread on Sunday morning, and some thunderstorms will be embedded within the rain as it lifts across the Stateline. Some locally heavy rainfall amounts of over an inch may occur in those areas that have thunderstorms on Sunday. Showers and thunderstorms will come to an end on Sunday evening with the passage of a warm front to our north followed quickly by a cool front from the west. A weak bubble of high pressure will provide quite a bit of sunshine on Monday, and it will be relatively mild with an afternoon high temperature in the middle to upper 50's. The high will fade from the picture during the afternoon as a new low pressure storm center begins to pull itself together over the eastern slopes of the Rockies. A stationary front will set up across central or southern Illinois, and a strong inflow of gulf moisture will intersect with the front bringing rain and thunderstorms to northern Illinois on Monday night and Tuesday. Once again there is the potential for some locally heavy rainfall as this system moves across the Stateline. The path of the low appears as if it will be across central Illinois on Wednesday morning. By that time lots of cold air from Canada will have been drawn into the circulation of the storm. The net result for residents of northern Illinois will be that rain will probably mix with wet snow on Tuesday night into Wednesday morning. It will be windy, too, along with chilly temperatures in the middle to upper 30's. On Wednesday afternoon it will probably be warm enough that any precipitation that occurs will be in the form of rain, but by Wednesday night, with temperatures dropping into the 20's, precipitation will change to light snow before ending. Admittedly, it is still quite far off to be very precise about what will happen with this second storm system, and forecast confidence is not very high. One thing to be fairly sure of, however, is the fact that after the second storm departs off to the east... it will be cold on Thursday and Friday of next week. It will not feel like spring at all with highs on Thursday and Friday only near freezing. It was mostly cloudy this afternoon, but the clouds have moved off to the southeast, and skies are now clear. High pressure over the northern plains will move to northern Wisconsin on Saturday. The clear moonlit skies tonight, and light northerly winds will allow temperatures to fall into the upper 20's by 7 am on Saturday morning, which is pretty close to average for this time of year. The high pressure will continue it's eastward trek on Saturday dominating Stateline weather with full sunshine, light northeasterly winds shifting around to the southeast by later afternoon. The high temperature will be round 54 degrees. Take advantage of the day if you can. Sunday will not be nearly so nice. Our attention turns to the west. There will be a couple of fairly significant weatfher systems that will have an impact on the stateline durning the next 6 days. The first system will push on to the northern plains on Sunday, and will have a good amount of gulf moisture to work with. Rain showers will begin after midnight on Saturday night, and continue into Sunday evening. There may be a couple of thunderstorms from Sunday afternoon into Sunday evening. Rainfall amounts will likely be in the .50" to .75" range with locally heavier amounts associated with any thunderstorms that develop. The system will move rapidly eastward pulling a front across northern Illinois during the pre-dawn hours on Monday morning. The frontal passage will effectively shut off the rainfall. A mild Pacific type of air mass will follow in behind the front on Monday producing a very pleasant mild day with afternoon temperatures in the low 60's. Enjoy the day Monday, because some big changes to colder weather will drop temperatures below average through the end of next week. A new Canadian cold front will sweep southward across the area by late Monday afternoon, and rain will move back into the Stateline on Monday night as an intensifying storm system spins itself up over northwestern Kansas. The storm will produce rainy and windy weather across the entire area on Tuesday that may mix with some wet snow on Tuesday night and Wednesday as the low passes to our south. On Wednesday it will be windy and cold with rain mixed with wet snow. As the system draws away on Wednesday night there could be some light snow as temperatures drop into the mid to upper 20's. The National Oceanic Atmospheric Administration (NOAA) released its Spring Outlook Thursday morning and says that flooding is already underway and is expected to worsen through April. The highest spring flood risk areas include the Red River of the North, which forms the state line between eastern North Dakota and northwest Minnesota, the Milk River in eastern Montana, the James and Big Sioux Rivers in South Dakota, the Minnesota River, the upper Mississippi River basin from Minneapolis southward to St. Louis, and a portion of lower New York, eastern Pennsylvania and northern New Jersey. Many metropolitan areas have a greater than 95 percent chance of major flooding, including Fargo, Grand Forks, St. Paul, Davenport, Rock Island, Sioux Falls and Huron. Devils Lake in North Dakota has an 80 percent chance of reaching two feet above last year’s record of 1452.1 feet. Warm temperatures in the forecast this week could cause much of the snowpack to melt across South Dakota and southern Minnesota, setting off moderate to major flooding in eastern South Dakota next week. Minor flooding could begin this week on the Mississippi River and its tributaries over southeastern Minnesota and southwestern Wisconsin, leading to moderate to major flooding by early April. In addition, a series of storm systems are forecast to move across the region during the next two weeks, which could bring additional snow or rain on top of the remaining snowpack. These systems may cause substantial runoff and the beginning of minor flooding in the southern headwater portion of the Red River of the North, eventually leading to major flooding sometime from the last week of March through early April. 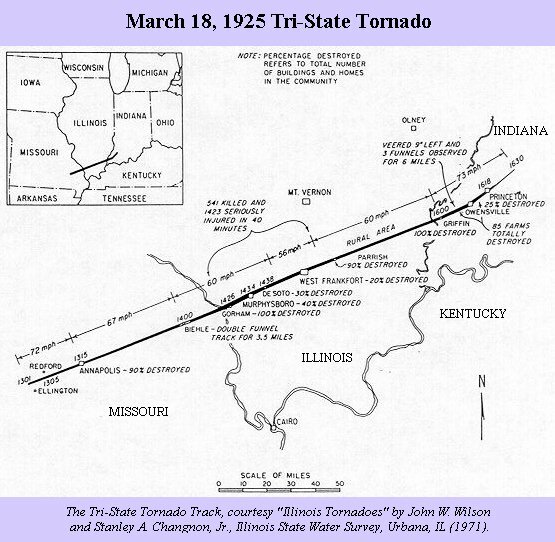 It was on this day 86 years ago the famous Tri-State Tornado moved through southeast Missouri, southern Illinois and southwest Indiana. The tornado started around 1pm that afternoon just northwest of Ellington, Missouri. 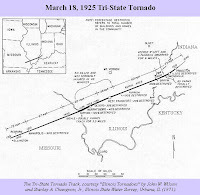 From there the tornado continued to travel northeast into southern Illinois where it completely wiped out the town of Gorham. Within the next 40 minutes, 541 people were killed as the tornado ripped through the towns of Murphysboro, De Soto, Hurst-Bush and West Frankfort. The death toll in Murphysboro, which was 234, is the largest within a single city in U.S. history! After moving through southern Illinois the tornado continued its destruction in southwest Indiana before weakening about 10 miles northeast of Princeton, IN. In all 695 people were killed as the tornado was, at times, a mile wide and traveled anywhere between 55 and 75 mph. The Paducah, KY NWS has a lot more information, along with pictures, detailing what lead up to this devastating tornado. The Warmest so far this Year! St. Patrick's day turned out to be a winner temperature-wise for all of northern Illinois. Rockford reached 67 degrees at 2:59 pm and stayed there past 5 pm. That reading was the warmest temperature reported at the airport since November 22nd, 2010 when the high was 69 degrees. Also...the first city in northern Illinois this season to reach 70 degrees was Savannah. It will not be as warm tomorrow. A cold front has pushed though Rockford this evening, and it will continue it's southward move ovenight. High pressure will begin to take charge of area weather on Friday as it nudges into the upper midwest bringing cooler temperatures on a northerly wind running about 10 mph. It will be cooler, but not drastically so, with an afternoon high in the low 50's which is still above average for this time of year. Skies will clear on Friday night and temperatures will drop into the upper 20's. Saturday will turn out to be a great day with sunshine, blue skies, light northeast winds with a comfortable afternoon high in the low 50's. A developing warm front will set up across the middle Mississippi Valley by late Sunday, and approach the Stateline early on Monday morning. That will set the stage for showers and thunderstorms on Sunday and Sunday night as an incrreasing flow of warm moist Gulf air rides up and over cool air in place over northern Illinois. Another disturbance will follow on the heels of the first, and keep precipitation going off and on through Tuesday night, when colder air will follow in behind the second departing low pressure system mixing some wet snow in with the rain, and that mixture may last through early Wednesday. The rest of the week will be chilly with high temperatures in the mid to upper 30's. 11:30am Update: The storms that had developed earlier this morning across eastern Iowa have continued to fizzle out as they moved east...away from the moisture source. Clouds will begin to roll in with the cold front with a few showers possible later this afternoon. 8:30am Update: A cold front currently moving through western Iowa early this morning has caused a few storm cells to pop just west of Cedar Rapids. Moisture pooling right along the front, dew points sit in the upper 40s/low 50s, has helped develop these storms. Moving to the northeast around 35 mph they may move into our far northwest counties later this morning. We'll continue to watch the radars for any further development around the area throughout the morning. A very mild southwesterly air flow has developed on the back side of high pressure over the southeastern states. The air is quite dry with the present trajectory coming out of the southern plains. It will remain mild overnight, and on St. Patrick's Day the temperature will top out around 63 degrees. If we happen to get more sunshine than is presently expected, temperatures could reach the upper 60's. The system is moisture starved, but with a cool front moving into the area in the evening there may be enough instability to cause some rumbles of thunder along with light rain showers in the afternoon and evening. After the cool front slips to the southeast the rain showers will come to an end before midnight. It will be partly cloudy and cooler on Friday. On Saturday a ridge of high pressure will nose it's way across the upper midwest with light northeasterly winds, plentiful sunshine, and a temperature in the low 50's. Sunday will start off mostly sunny, but it will cloud over in the afternoon with southeasterly winds developing in advance of a complex area of low pressure over the plains. There is a chance of some rain showers in the afternoon that may blossom into thunderstorms on Sunday night with plentiful moisture from the Gulf of Mexico over-running a warm front moving northward from the lower Mississippi River Valley into the Stateline area by 6 am on Monday morning. That storm system will then move off to the northeast, only to have another system follow right on it's heels by Tuesday morning. The net effect for the Stateline will be continuing chances of showers and thunderstorms off and on from Sunday night through late Tuesday. Colder air from Canada will follow in behind the departing storm system on Tuesday night, and rain could mix with wet snow overnight into the morning hours on Wednesday. Next Week: Possible Flooding Concerns? While rainfall doesn't appear to be too significant this week, next week could be a different story. The jetstream will begin to dip south across the four corners region of the U.S. which will keep the west coast on the cool side but help bring another round of above average weather across the Midwest. This will also, however, help pump gulf moisture into the area as the general storm track will likely remain to the west. While it has yet to be seen how local rivers will react and just how much rain we will actually get, it is something we'll keep an eye on through the weekend. March 14th - 18th is Flood Safety Awareness Week. Click here for find out more information. This year, the globe experienced the 17th warmest February since record keeping began in 1880, as the climate phenomenon La Niña continued to be a significant factor. Last month’s average Arctic sea ice extent tied with 2005 as the smallest extent for February in its 32-year period of record. The monthly analysis from NOAA’s National Climatic Data Center is part of the suite of climate services NOAA provides government, business and community leaders so they can make informed decisions. 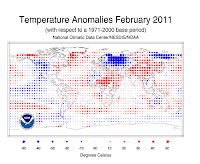 The combined global land and ocean average surface temperature for February 2011 was the 17th warmest on record at 54.62 F (12.50 C), which is 0.72 F (0.40 C) above the 20th century average of 53.9 F (12.1 C). The margin of error associated with this temperature is +/- 0.18 F (0.10 C). Separately, the global land surface temperature was 0.92 F (0.51 C) above the 20th century average of 37.8 F (3.2 C), which tied for the 28th warmest February on record. The margin of error is +/- 0.56 F (0.31 C). Warmer-than-average conditions occurred across most of Asia, central Africa, northern Alaska and southern Greenland. Cooler-than-average regions included Eastern Europe, western Russia, eastern Siberia and the western United States. The February global ocean surface temperature was 0.65 F (0.36 C) above the 20th century average of 60.6 F (15.9 C), making it the 10th warmest February on record. The margin of error is +/- 0.13 F (0.07 C). The warmth was most pronounced across the northern Pacific Ocean, the tropical Atlantic Ocean and part of the North Atlantic near Greenland and Canada. The combined global land and ocean average surface temperature for Northern Hemisphere winter (December 2010 – February 2011) was 0.70 F (0.39 C) above the 20th century average of 53.8 F (12.1 C), making it the 16th warmest on record. The margin of error is +/- 0.16 F (0.09 C). The December 2010 – February 2011 worldwide land surface temperature was 0.81 F (0.45 C) above the 20th century average of 37.8 F (3.2 C) — the 26th warmest such period on record. The margin of error is +/- 0.32 F (0.18 C). Warmer-than-average conditions were particularly felt across eastern Canada, southern Greenland and northern Siberia. Cooler-than-average regions included Eastern Europe, western Russia and Mongolia. The global ocean surface temperature for December 2010 – February 2011 was 0.65 F (0.36 C) above the 20th century average of 60.5 F (15.8 C) and tied for the 10th warmest such period on record. The margin of error is +/-0.13 F (0.07 C). The warmth was most pronounced across the northern Pacific Ocean, the tropical Atlantic Ocean, and the North Atlantic, near Greenland and Canada. La Niña conditions weakened in February, although sea-surface temperatures remained below normal across the central and eastern equatorial Pacific Ocean. According to NOAA’s Climate Prediction Center, La Niña will continue to have global impacts for the next several months, but neither La Niña nor El Niño are expected to affect the region by June. The average Arctic sea ice extent for February was 5.54 million square miles (14.36 million square km), which is 8.2 percent below average. This ties with February 2005 as the smallest February Arctic sea ice extent since records began in 1979 and is the third consecutive month with record low Arctic ice extent. For the winter period, the Northern Hemisphere snow cover extent over land averaged 760,000 square miles (1.98 million square km) above average, ranking as the third largest seasonal snow cover extent on record behind the winters of 1977–1978 and 2009–2010. The North American season snow cover extent was the third largest on record, while Eurasia’s was fourth largest. Average rainfall across Australia was 76 percent above average during February, making it the second wettest February on record behind 2000. Rainfall in South Australia was more than four times above average, the wettest February on record for the state. The summer period (December 2010 – February 2011) was the second wettest summer on record for Australia. A ridge of high pressure to the south this morning has helped skies clear, but has also led to a little fog development. That shouldn't be too much of a concern as we head into the rest of the afternoon as skies remain partly sunny. Temperatures will reach the upper 50s later today as winds continue from the south. A warm front will lift north this evening pulling gulf moisture northward into the Great Lakes. This will keep temperatures from falling too much with lows expected to remain in the 40s. With a brisk southerly wind Thursday, highs should be able to manage the low 60s before a cold front moves through. If we can hold off on any rain and see a little sunshine, we may be able to squeeze out the middle 60s. We'll have to see on that one! Either way temperatures are expected to remain above average at least for the next 7-10 days. "The site of Friday's devastating earthquake, as well as an ongoing nuclear crisis, on northeast Honshu Island, Japan, will be visited by a winter storm bringing cold rain as well as snow. The adverse weather will pose extra challenges to earthquake and tsunami victims as well as rescue crews. Most of the precipitation will fall Tuesday into Tuesday night, local time, or Monday night into Tuesday, EDT. North of Sendai, snow will likely fall right to the edge of the sea leaving amounts of up to 6 inches through Tuesday, EDT, in the hills between Sendai and Aomori. In greater Sendai and areas southward, cold rain and wet snow will chill the coast with precipitation becoming mostly snow in many areas inland. Temperatures will range mostly between 30 and the lower 40s across these areas. On Wednesday and Thursday, EDT, the weather will be blustery and cold with snow showers, most of them happening northward from Sendai. Nighttime temperatures will dip below freezing with readings down to about 20 degrees inland." It looks like the first full week of spring will feature temperatures rising above, if not well above, average! A change in the jetstream will cause a trough to dig in the southwest while a ridge of high pressure builds over roughly 2/3's of the U.S. While we've got a few upper 50s and even a 60° in the next seven days, the middle 60s could be here as soon as next Sunday. Unfortunately this will come with the chance of above averege precipitation. During this time frame the favored stormtrack will likely move from the southwest to the Midwest/Great Lakes. While the precipitation chances don't look too significant this week, next week could be a different story. 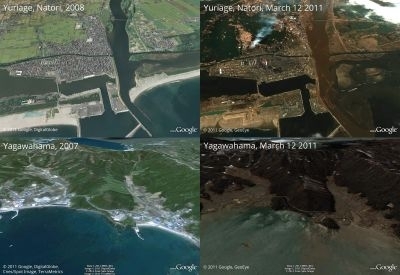 As details and images continue to develop after Japan's 8.9 magnitude earthquake Friday, satellite images give a before and after look of those areas hit by the earthquake and tsunami that followed. These were taken by the GeoEye - 1 Satellite. Absolutely amazing! A massive high pressure ridge extends form Quebec southwest across Wisconsin and Iowa into the Texas panhandle. A low pressure storm system is moving eastward out of Oklahoma into Arkansas tonight. Rainfall is associated with this system from southeastern Kansas across southern and central Missouri into southern Illinois. There is some snow in the northwestern quadrant of this storm over north central Kansas into southeastern Nebraska. This system will not produce any precipitation for the Stateline. Rain will gradually edge northward and northeastward as the low lifts across western Kentucky into southeastern Indiana by 7 am on Tuesday. Kankakee is about as close as the rain will get to the Stateline with the ridge of high pressure dominating our region though early Tuesday. The atmosphere will gradually warm this week with temperatures reaching close to 50 degrees on Tuesday, 56 degrees on Wednesday, and 59 degrees on Thursday (St. Patricks Day) with a warm front passing north through the area. So, some gulf moisture will be in place on Thursday as a Pacific cool front apporaches from the west later in the afternoon encouraging the development of some showers that may linger into the early morning hours on Friday. The good news is that there will only be a minor cool down following the passage of the cool front with temperatures remaining about average for the season on Friday and Saturday. By Sunday when the Vernal Equinox occurs at 6:21 pm cdt a brisk southerly air flow will pump in more gulf moisture, and kick off some showers and thunderstorms associated with the next storm system moving out of the Rockies Byinto the plains and midwest. High temperatures next Sunday will likley be back into 50's again. A tight pressure gradient between low pressure over the eastern Great Lakes and a ridge of high pressure over the northern plains caused very wind conditions across the Stateline on Saturday afternoon with northwesterly winds gusting to 40 mph. The gradient is loosening tonight, and the winds are diminishing. As the ridge gets closer the clouds will decrease too, and the sky will become partly cloudy before morning. Skies will be partly cloudy for most of the day on Sunday, but with drier air moving in it may become mostly sunny during the afternoon. It will be cool, too, with an afternoon high temperature only in the upper 30's. Clear and cool conditions will prevail on Sunday night with a low in the low 20's. On Monday it will be sunny with temperatures moderating into the middle 40's, which it close to the seasonal average. A new storm system will pass well to our south early next week as it brushes St. Louis and Louisville, Kentucky with rain. The ridge of high pressure will maintain control through Wednesday, and shift off to the east on Thursday as the next front approaches from the plains. What does all this mean for the Stateline? A nice warm up is on the way between Monday and Thursday that will push temperatures into the middle 50's by Wednesday and the upper 50's on Thursday. The next cool front will pass through the Stateline later on Thursday with the threat of a few showers, and possibly a thunderstorm. As of this time it appears as if there will not be any significant rainfall, and any rain that falls will be scattered. The showers should end during the evening as the front moves off to the southeast. The good news is that there will not be a drastic cool down following the passage of the cool front. The high pressure following in behind the front is from the Pacific, so although it will be cooler, temperatures will remain at or above average. 8:15am: Reports are now coming in that waves are beginning to hit the western Hawaiian Islands. Reverse 911 calls now are being done for residents who live further north along the U.S. West Coast - calling for people in low lying areas to evacuate. 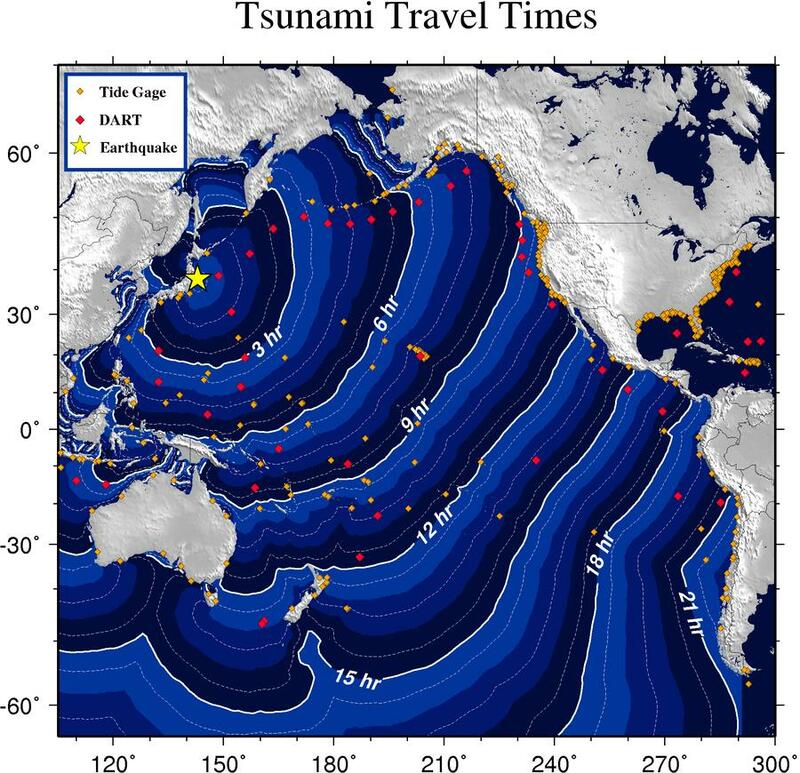 Tsunami is expected to be a little worse further to the north. 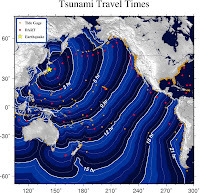 Tsunami Warnings have been issued for the Hawaiian Islands along with the U.S. west coast. TOKYO(AP) — Japan was struck by a magnitude 8.9 earthquake off its northeastern coast Friday, unleashing a 13-foot (4-meter) tsunami that washed away cars and tore away buildings along the coast near the epicenter. There were reports of injuries in Tokyo. In various locations along Japan's coast, TV footage showed massive damage from the tsunami, with dozens of cars, boats and even buildings being carried along by waters. A large ship swept away by the tsunami rammed directly into a breakwater in Kesennuma city in Miyagi prefecture, according to footage on public broadcaster NHK. Officials were trying to assess damage, injuries and deaths from the quake but had no immediate details. The quake that struck at 2:46 p.m. was followed by a series of powerful aftershocks, including a 7.4-magnitude one about 30 minutes later. The U.S. Geological Survey upgraded the strength of the first quake to a magnitude 8.9, while Japan's meteorological agency measured it at 7.9. The meteorological agency issued a tsunami warning for the entire Pacific coast of Japan. NHK was warning those near the coast to get to safer ground. The Pacific Tsunami Warning Center in Hawaii said a tsunami warning was in effect for Japan, Russia, Marcus Island and the Northern Marianas. A tsunami watch has been issued for Guam, Taiwan, the Philippines, Indonesia and the U.S. state of Hawaii. The quake struck at a depth of six miles (10 kilometers), about 80 miles (125 kilometers) off the eastern coast, the agency said. The area is 240 miles (380 kilometers) northeast of Tokyo. In downtown Tokyo, large buildings shook violently and workers poured into the street for safety. TV footage showed a large building on fire and bellowing smoke in the Odaiba district of Tokyo. In central Tokyo, trains were stopped and passengers walked along the tracks to platforms. The ceiling in Kudan Kaikan, a large hall in Tokyo, collapsed, injuring an unknown number of people, NHK said. Footage on NHK from their Sendai office showed employees stumbling around and books and papers crashing from desks. It also showed a glass shelter at a bus stop in Tokyo completely smashed by the quake and a weeping woman nearby being comforted by another woman. Several quakes had hit the same region in recent days, including a 7.3 magnitude one on Wednesday. Thirty minutes after the quake, tall buildings were still swaying in Tokyo and mobile phone networks were not working. Japan's Coast Guard has set up task force and officials are standing by for emergency contingencies, Coast Guard official Yosuke Oi said. As we look ahead into the next couple of weeks the pattern appears to remain fairly active with a storm system every couple of days, but this could bring warmer temperatures as early as the middle of next week. We've got a few storm systems lined up in the Pacific that will begin to move through - with the first coming late on Friday. This one will likely take a more northerly track but southerly winds ahead of it will help boost temperatures into the upper 40s to near 50°. The next one to move in will come Tuesday night followed by another Thursday. Even though we may cool some as each low passes they will help draw in warmer temperatures. We may be flirting with the 60s as early as next Tuesday or Wednesday (I went with 55° for next Wednesday, but if this trend continues I will gladly raise my high!) While this is a ways away and things may change, March is typically thought of as a 'transition' month. We see our greatest range in average high temperatures with the average high at the beginning of the month at 39° and the average high of 53° at the end. We've even been know to hit a few 70s. The low that brought us the rain and snow Wednesday morning is now moving into the northeast leaving cloudy skies in its wake. Cloudy skies and gusty winds can be expected throughout the day with highs sitting in the upper 30s. We may be able to squeeze out sunshine later this afternoon as high pressure slides to the south. We'll be on the backside of that high tomorrow which should switch our winds to the south bumping temperatures close to 50°! Skies will remain partly sunny ahead of a quick clipper system that will slide to the north early Saturday morning. Moisture looks to remain fairly slim with this next one so precipitation shouldn't be much, if any at all. Temperatures remain in the 40s this weekend before we could see the middle 50s by next week!! Flood waters in Ohio wash away a home yesterday. Continued rainfall out east have caused many rivers to rise above flood stage as Flood Watches and Warnings continue up and down the Ohio River Valley. A late season snow storm hit parts of the Mediterranean coast today, accompanied by very high winds. 6" of the white stuff fell at Tripolis, Greece and at Ankara, Turkey. (The picture at left was taken just outside of Athens on Penteli Mountain.) 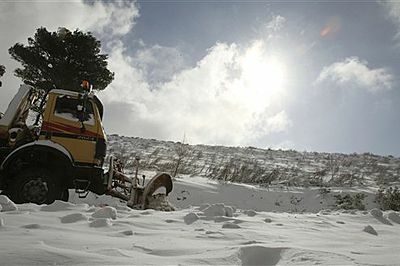 The snow came with 70 mph winds on the island of Limnos, Greece, with 60mph wind gusts in many other areas. A cold airmass over Russia and the Ukraine earlier in the week helped to create the snow storm. This airmass traversed the Black and Aegean Seas and dropped into Greece and Turkey today. Look for the rain/snow mix to continue through this morning with minor accumulations of snowfall, especially north of the Rockford area. Anywhere between a quarter to half an inch of rainfall has fallen through the overnight across north-central Illinois but between 2-4 inches of snow has fallen across extreme northwest Jo Daviess county and into Rock and Green counties. This will continue as the low, currently in west-central Illinois, lifts northeast this morning. A little dry air moving into the mid-levels of the atmosphere may cut off the heaviest of the rain/snow leaving drizzle and fog through the afternoon hours. Temperatures will fall back into the low 30s later this afternoon which will allow a few light snow showers to fall this evening with only minor accumulations expected. Shannon: rainfall at 5am - 0.25"
Rochelle: rainfall at 6am - 0.45"
Kingston: rainfall at 6am - 0.46"
5 S Elizabeth (Jo Daviess Co.) - snow 0.6"
Galena (Jo Daviess Co.) - snow 0.8"
Apple River Canyon (Jo Daviess Co.) - snow 1.0"
3 NW Orangeville (Stephenson Co.) - snow 0.1"
1 N Davis (Stephenso Co.) - snow 0.5"